Instant Bookings for Saturday to Saturday dates ONLY. Email us before using Instant Booking if you need flexibility on dates other than Saturday check in and out. New Furnishings. Gorgeous direct gulf views from Maravilla 2403, top (4th floor) so awesome views and just steps to elevator or stairs. All my units have queen sleeper sofas in living room. Conveniences include a fully-equipped kitchen, all linens, washer/dryer in unit. Flat screen TV's in living rooms and bedrooms, DVD/VCR and stereo. We are pet friendly and our units are non-smoking. Maravilla Amenities include: 2.5 acre private beach, 2 pools (1 seasonally heated), hot tub, 2 tennis courts, shuffleboard, fitness room, clubhouse, BBQ Grills at both pools, and large parking area. This is a family complex with plenty of green space for play. Call for additional information, rates and other condo locations and availability. Maravilla 2403 is my own personal condo. It is my priority to provide excellent accommodations to all my renters, as well as the opportunity to find them excellent real estate opportunities for investment or personal enjoyment. Our family and friends have vacationed in Destin for years. We decided to purchase a condo in Destin because of the beautiful beaches, family atmosphere, and the abundance of things to do there. Shopping, dining, entertainment, fishing, watersports are all just steps away. Please call me anytime with questions or for additional information 6786147467. I also have other 2 and 3 bedroom condos available. Maravilla has lots of greenspace, tennis, basketball, 2 pools, fitness room and hot tub to enjoy daily. We have our own private beach, and I provide complimentary 2 lounges and beach umbrella service (seasonal) and WIFI internet for entire stay. Master Bath has tub/shower combination. Guest bath has walk in shower. Maravilla Condos include 2 pools, hot tub, tennis courts, basketball, shuffleboard, fitness room, barbecue grills at both pools/one of which is heated and our own private beach. Maravilla 2403 has unobstructed views of beautiful private beach. Beautiful unobstructed direct gulf views at Maravilla 2403. Conveniently located near elevator or stairs. Living Room with new furnishings including sectional sofa, sliders to balcony and direct gulf views. Stainless side by side with icemaker. New upgraded stainless kitchen and granite counters. Fully equipped kitchen has dishwasher, microwave, side by side refrigerator and all dishes and utensils, blender, mixer, disposal etc. Full size washer and dryer in condo. (3) Master bedroom, Guest bedroom, Livingroom with new large flatscreens! All bedrooms have cable television. Maravilla master bedroom and livingroom lead to balcony with new comfortable chairs and lounges with plus cushions. Emerald Bay, Regatta Bay, Seascape Indian Bayou and Sandestin Golf courses located nearby. Maravilla has 2 pools, back pool is heated seasonally. 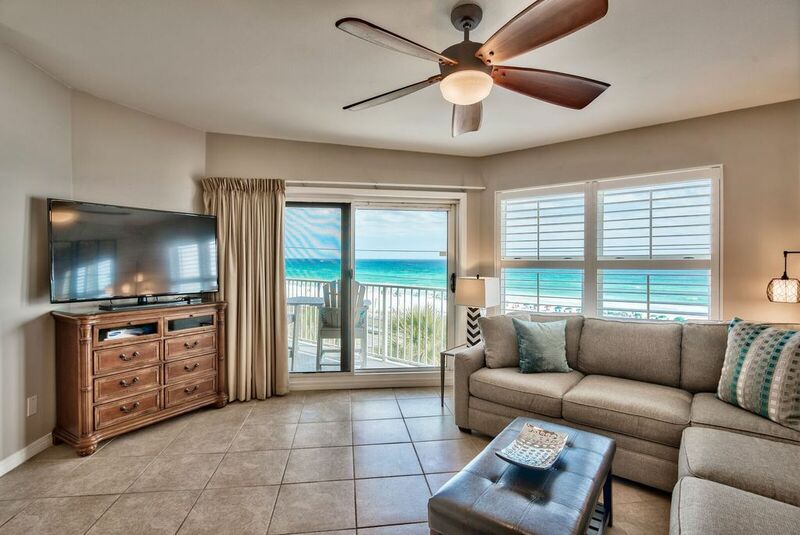 Full size washer/dryer in condo, ##Complimentary Beach Umbrella Service and 2 lounge chairs provided daily (seasonal). ###Complimentary High Speed Internet WIFI. Close to Pompano Joe's and Crab Trap Restaurants, Silver Sands Outlets, Destin Commons, Harbor Walk Village, Sandestin, Destin Harbor, shopping, fishing, restaurants, entertainment.